Thanks for tuning in to another episode of Table Talk, the column where three New Pulp authors talk about whatever questions happen to teleport through the quantum pockets of their nebulous imaginations. This week, Barry Reese, Bobby Nash, and Mike Bullock dig into the mailbag and respond to more questions from you, the readers. Join the conversation. Leave us a comment on the blog and let us know your thoughts on this topic. We’d love to hear your thoughts and questions. Have a question you want the Table Talk Trio to answer? Send it to newpulpfiction@gmail.com with "Table Talk Question" in the subject line. Also, let us know if you want attribution for the question, or you'd rather remain anonymous. Please, keep the questions pertinent to the creation of New Pulp and/or writing speculative fiction in general. We'll get the questions worked into future columns. Follow the Table Talk Trio on Twitter @BarryReesePulp @BobbyNash @MikeABullock and Facebook. Airship 27 Productions announces the release a brand new fantasy novel by noted comic book writer, R.A. Jones; “Deathwalker.” Jones is best remembered for is early work for Malibu Comics where he created the adult action series, “Scimitar” along with artist Rob Davis. Now he turns his imagination to a different kind of hero, this one inspired by a certain Robert E. Howard barbarian. While on his vision quest, the young Cheyenne brave High Bird encounters the spirit of Death. The powerful wraith recruits the boy as his new agent in the world and High Bird returns to his tribe altered forever as Deathwalker. When the Cheyenne become the target of a vengeful Pawnee Shaman, Stands Alone, only Deathwalker can stand between this evil sorcerer and the total destruction of his people. 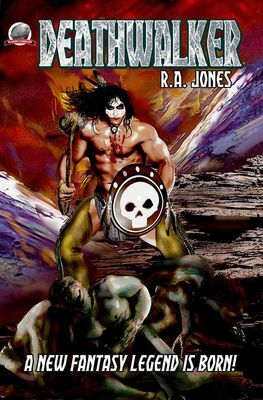 Writer R.A. Jones has woven a new and exciting fantasy set against the background of authentic Native American lore and culture. He dares to imagine what this wild untamed land would have become had there been no conquests by outside civilizations beyond the great waters. Here is an old world re-envisioned in a bold new action packed adventure worthy of pulp writers such as Robert E. Howard and Edgar Rice Burroughs. Featuring stunning cover art by Laura Givens with interior illustrations by Michael Neno. Airship27 is proud to present R.A. Jones’ DEATHWALKER, another original and quality title in the New Pulp movement. Available at three sites on-line. Pulp show in late April and the awards presented. Good luck to all.